MITTAG Blog: New Embryo Purchase! Tucker is extremely excited to have acquired Smokin' Bob embryos out of the Great Aggie Cow from Tusa and Rosa! 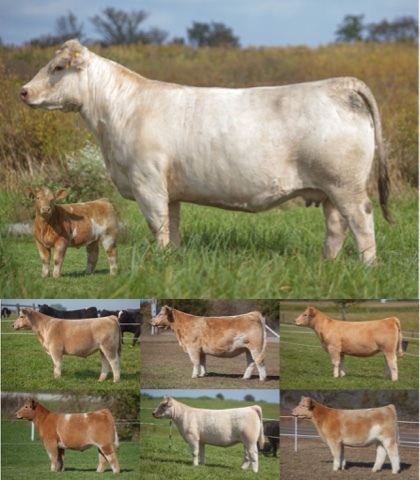 Aggie is a purebred Charolais cow (Firewater x HooDoo George 7075) that has taken the club calf world by storm. The very best of cattlemen have inquired about her after she sold several calves in just two short years of production. She has already produced a multiple champion to boot! In 2015 a Monopoly steer calf was sold by Wade Rodgers for $35,000+ . Not only did Aggie produce this promising young steer by Monopoly, she also had a great flush to Solid Gold, with a steer selling for $25,000 to Brian Martin as well as a heifer calf selling for $19,500. She also had an $17,500 Monopoly heifer and a $11,000 Monopoly Steer. In 2014 Aggie raised one of the high Selling steers in Tracy Goretska's Sale at $22,000, that went on to be multiple time Charolais Champion at shows from the Wisconsin Badger to the Missouri State Fair. She also had a high selling Solid Gold heifer in Hunter Bros Sale at $19,000. We think very highly of this female as she has sold almost $200,000 worth of progeny in two years! Aggie is a young cow that is just getting started. We feel one of her strongest attributes is her ability to consistently produce High Quality Cattle without a bottom end. They all seem to be high end, quality Cattle!